For the most part, there are really no surprises regarding the Eastern Conference All-Stars, although there could be some argument regarding Carlos Boozer getting the nod over Kevin Garnett. Boozer is the third leading scorer for forwards in the Eastern Conference at 19.5 PPG, and is leading the conference as a forward in rebounds at 10.1 RPG. He also has a higher shooting percentage than Garnett, ranked 8th in the NBA, and they are both averaging 2.4 assists per game. 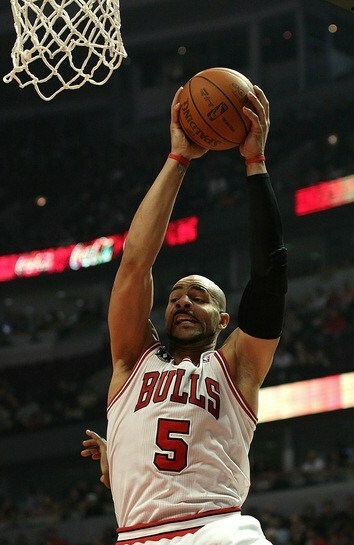 Boozer is ranked 15th in the NBA in double doubles (22) this season while only playing in 34 games due to injury. Garnett is averaging his lowest point production of his career, other than his rookie season and last year. I also feel that Carlos Boozer adds more value to his team than Garnett does with the Celtics. If you still think Garnett should be in the All-Star game, then you could also argue that Carlos Boozer should get the nod over another selected All-Star, Chris Bosh. Boozer is averaging more points, has a higher shooting percentage, and is averaging more assists and rebounds per game than Bosh. Bosh is averaging the fewest rebounds per game, assists per game, and blocks per game since his rookie season, and his lowest scoring average in the last six years. There are a lot of other statistics and intangibles that go into an All-Star selection, but again, I feel that Carlos Boozer adds more value to the Chicago Bulls than Chris Bosh does to the Miami Heat. If you look at the Western Conference All-Stars, there are some players you could argue about. First off, Yao Ming has been injured all season, and has only played in 5 games. How he could even be considered an All-Star is beyond me, but at least the NBA did the right thing and replaced him with Kevin Love, the league’s leader in rebounds (15.4 RPG), and double doubles (50). However, Kevin Love should have replaced Tim Duncan at the Forward position. Duncan is averaging 4.5 points less than he ever has in his career, is averaging under double-digit rebounds for the first time in his career, and is tied for the lowest shooting percentage of his entire 13 year career. This is far from an all-star season for Tim Duncan, and if Kevin Love would have replaced him instead of Yao Ming, it would have left an opening for a true center to make the All-Star roster. Al Jefferson is deserving of that spot. As far as centers in the Western Conference, he is second in scoring (17.0), double doubles (21), points/rebounds/assists per game (27.6), blocks per game (1.91)., and fifth in total rebounds (9.0). What more needs to be said other than Kevin Love should replace Tim Duncan for obvious reasons (just look at the stats above), and Al Jefferson should replace Yao Ming due to injury. The most noticeable name that was left off of the NBA All-Star game on any roster was of course Steve Nash. How can anyone not put him on the team, especially after seeing Kevin Garnett, Chris Bosh, and Tim Duncan make the roster. There are a number of players Nash could replace, but most noticebly it would have to be Manu Ginobili. Nash ranks considerably higher in almost every statistic over Ginobili other than scoring (16.8 to 17.9) and rebounds (3.6 to 3.8). Out of the ten guards selected for the NBA All-Star game, Nash has the best shooting (.523) and free throw percentage (.914) of them all, the second highest assists (11.2), and the third highest 3-point percentage (.407) and assist to turnover ratio (3.07). Nash is 5th in the NBA in double doubles (31) this season. Nash is also averaging more points than selected All-Star guards Chris Paul (16.5) and Rajon Rondo (11.0). Nash is having as good a season as he ever has in his most recent six years as a Sun, including his back-to-back MVP seasons. All these statistics don’t even account for the fact that his team has had a complete facelift and he is trying to mesh with seven new teammates, three which arrived about 25 games into the season, yet Nash hasn’t missed a beat. 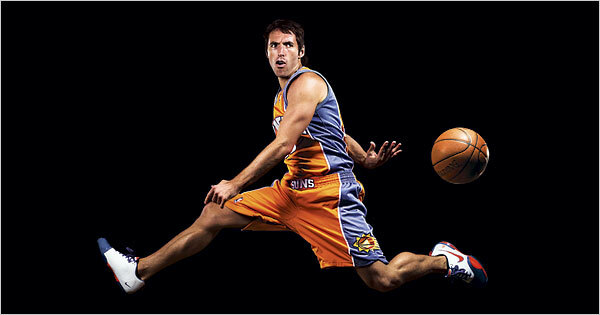 There is no doubt that Steve Nash makes all players around him better. Not to mention, Nash is one of the best when it comes to no-look, between the legs, behind the back, and over the back, passes and alley-oops. There are a few questionable players on this years NBA All-Star roster for sure. On February 20th, the NBA All-Star game will be an entertaining event with lots of athleticism, highlights, and scoring. Unfortunately the game will not include some of the best players this year, and one of the NBA’s best players of all-time. After all, the NBA All-Star game is all about putting on a show for the fans, and Steve Nash is one of the greatest showmen of them all. ~ by Troy Erickson Realtor on February 15, 2011. Great insights. I think basing the all star selections on fan votes is the biggest part of the problem. Yao Ming? Really? I agreee that Bosh, Duncan, Garnet, and Ginobli should have been replaced with more deserving players. Thanks Tom – Yes, many fans really don’t know all the NBA players, or the game that well, and that does cause a problem. However, the fan ballots only select the All-Star starters by way of the leading vote recipient in each position. After that, the reserves are chosen by a vote among the head coaches in each conference, and the coaches are not allowed to vote for their own players. Further, if a player is injured, the commissioner will select the replacement, as was the case with Kevin Love replacing Yao Ming this year. Thank you so much for your comments. Feel free to spread the word about my blog, and stop by often.